Raised in Mexico, Ivaldo first came to love art as a natural artist. Inspired by his surroundings, he started using texture as a means to convey the complexities he found his world – both external and internal. He experimented with different techniques and approaches to his work and somehow managed to cross the chasm between natural and abstract art.His present work straddles along neither side of the spectrum, but within the actual divide: it’s referential to nature and the “real world”, but not to their physical embodiments. Ivaldo works with oil and mixed-media elements to express different textures combined with movements and layers that create windows of colorful dimensions. In the process Ivaldo sculpts and moves around the canvas searching for himself in deep moments of inspiration where painting becomes an adrenaline-fueled event of skill and dexterity, From there, the piece progresses along with his soul through the unknown moments that are fed by internal visualization, passion, and free flowing emotions. Went Ivaldo’s work is observed one can come up with a thousand syllogisms that may all end, intertwined as they are, with a one-word conclusion about his body of work: charged. Charged with energy, intellect, introspection, inspiration, passion and a seductive mystery, Ivaldo’s work is a window to his soul. Whatever he can extract from his subconscious, he layers on the canvas or glass with vigor and skill. These two mediums seem to give meaning to each other in his work as much as the actual subjects he uses like music and nature. He is more interested in the way textures, materials and mediums come together in the artistic process and their overall, harmonious effect on the visual representation of his ideas rather than the literal representation of his chosen subjects. A forest glimmering under the noonday sun isn’t just an “outdoor scene”, but a perception created through the various visual inputs. The shadows created by layering the painted glass on the painted backdrop not only create an additional dimension to the work, but also another emotional and intellectual construction anyone can easily access. It’s as if Ivaldo is inviting the world to look and understand beyond what they are seeing. You either dive in deep with him or you completely miss the point of the dark shadows, overlapping shapes and the sheer intensity of textures that he deliberately creates on his pieces. Ivaldo’s work is charged with complexity, idiosyncrasy and anything but the straightforwardly simple. Ivaldo’s work is collected internationally and has been assimilated into the permanent collections of many public spaces including the colossal, newly-built Amway Arena in Orlando, Florida. 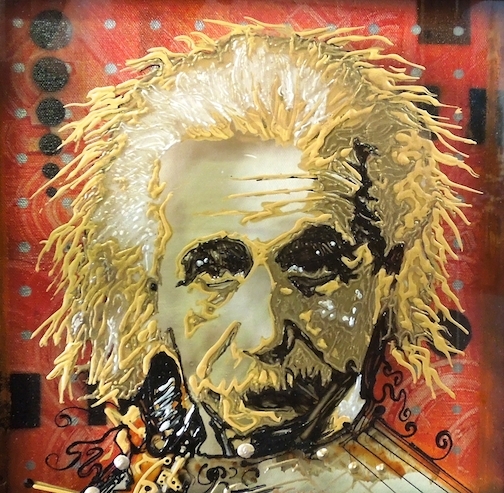 Unique représentation of Albert Einstein by Ivaldo Robles. Height 10" x Width 10" x Depth 1"
Painted on glass and canvas, its an abstract representation of Einsteins profile, with about half inch, the glass is separate from the canvas, giving it the effect of 3d and creating shadows in the background that at the same time will create movement on the image. The painting comes with a dark frame. 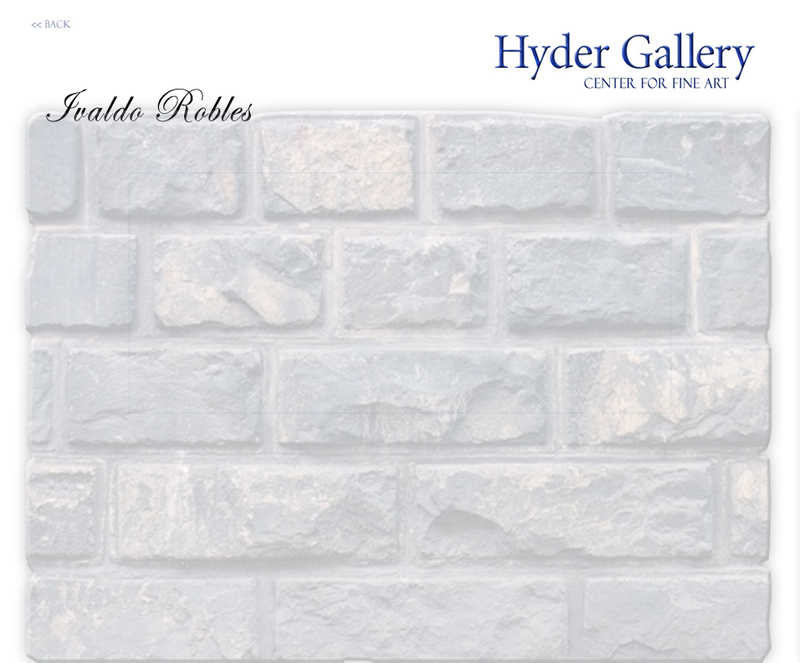 Ivaldo Robles Professional Artist Raised in Mexico, Ivaldo first came to love art as a natural artist. Inspired by his surroundings, he started using texture as a means to convey the complexities he found his world – both external and internal. He experimented with different techniques and approaches to his work and somehow managed to cross the chasm between natural and abstract art.His present work straddles along neither side of the spectrum, but within the actual divide: it’s referential to nature and the “real world”, but not to their physical embodiments. Ivaldo works with oil and mixed-media elements to express different textures combined with movements and layers that create windows of colorful dimensions. In the process Ivaldo sculpts and moves around the canvas searching for himself in deep moments of inspiration where painting becomes an adrenaline-fueled event of skill and dexterity, From there, the piece progresses along with his soul through the unknown moments that are fed by internal visualization, passion, and free flowing emotions. Went Ivaldo’s work is observed one can come up with a thousand syllogisms that may all end, intertwined as they are, with a one-word conclusion about his body of work: charged. Charged with energy, intellect, introspection, inspiration, passion and a seductive mystery, Ivaldo’s work is a window to his soul. Whatever he can extract from his subconscious, he layers on the canvas or glass with vigor and skill. These two mediums seem to give meaning to each other in his work as much as the actual subjects he uses like music and nature. He is more interested in the way textures, materials and mediums come together in the artistic process and their overall, harmonious effect on the visual representation of his ideas rather than the literal representation of his chosen subjects. A forest glimmering under the noonday sun isn’t just an “outdoor scene”, but a perception created through the various visual inputs. The shadows created by layering the painted glass on the painted backdrop not only create an additional dimension to the work, but also another emotional and intellectual construction anyone can easily access. It’s as if Ivaldo is inviting the world to look and understand beyond what they are seeing. You either dive in deep with him or you completely miss the point of the dark shadows, overlapping shapes and the sheer intensity of textures that he deliberately creates on his pieces. Ivaldo’s work is charged with complexity, idiosyncrasy and anything but the straightforwardly simple. Ivaldo’s work is collected internationally and has been assimilated into the permanent collections of many public spaces including the colossal, newly-built Amway Arena in Orlando, Florida.